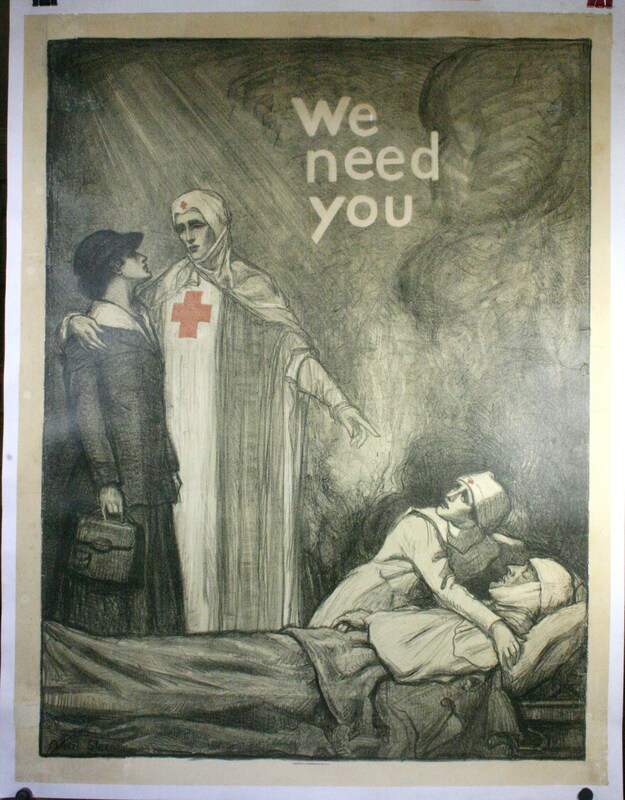 WE NEED YOU, ca 1908. This poster was printed during the first world war and was designed by Albert Steiner, an American artist famous for this type of drypoint engraving. He was born in 1863 in England and died in 1946 in New York where he lived most of his life. 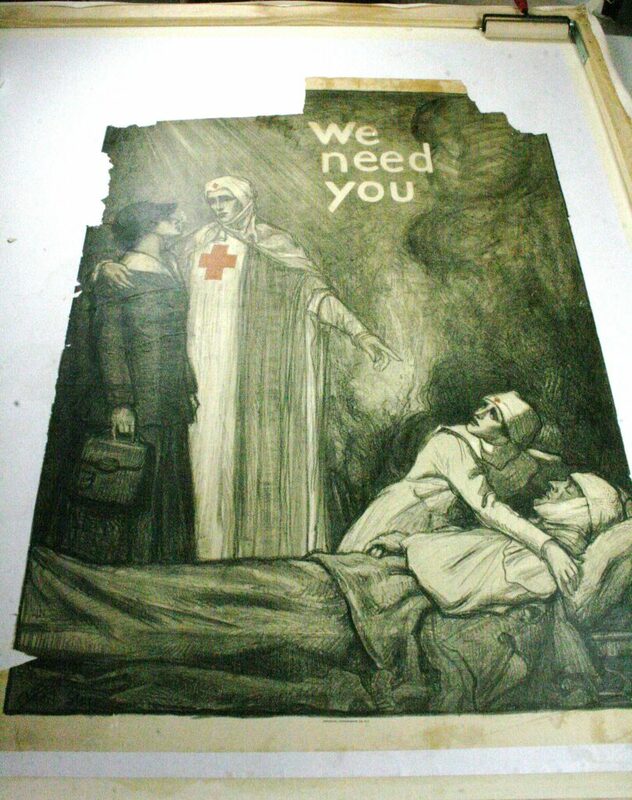 This allegorical work, depicting a nurse desperately trying to help a wounded patient hardly need the words “We Need You” to convey the need for new recruits to tend all the wounded. Unfortunately, this poster was in very poor condition having lost its margins and several interior pieces of the design. Though difficult to see from the photo the paper was also very brittle and acid stained from age. 95 year old can do that! After placing the poster in an alkali bath for a few hours to clean and brighten the poster it was then dried between several changes of blotting paper under heavy weights before preparing the poster for linen backing. Not surprisingly, the poster fell apart in the bath. However, during soaking, the paper fibers become re-hydrated and supple, loosing their original brittleness. 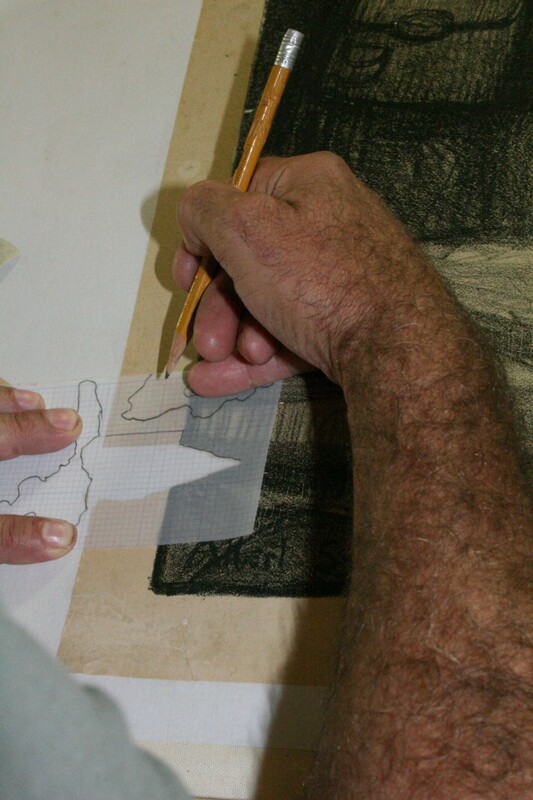 Mounting the paper onto the linen is not unlike working a jigsaw with less pieces. Each piece is floated onto the linen with a wheat starch paste that containing an alkali buffer. 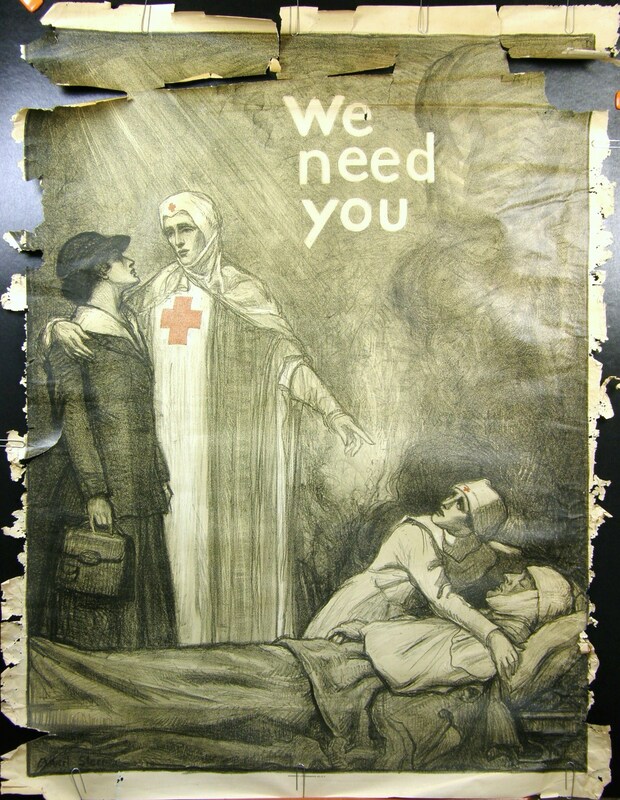 Once dry the poster was repaired using donor paper from other posters of this age. In this case many pieces were missing and were duplicated in size using a tracing and a patch slightly larger than the missing piece. Both the margins of the patch and the poster are then sanded to allow for feathering of the patch at the join. In this way, a line is not so visible where the patch meets the poster. Once all the missing paper is replaced the job of filling in the design is undertaken which is where the artist’s skills are really needed. The poster will always be a “restored” poster and the intent is not to hide this fact but make the restoration as invisible as possible so as not to detract from the aesthetics of the poster as a whole. 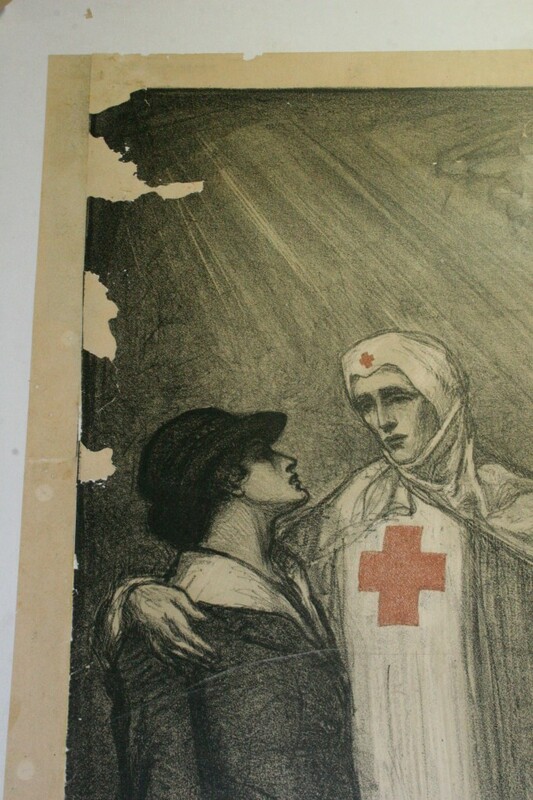 Repairs and restorations are easy to spot up close but our hope is from a normal viewing distance the poster looks like the artist wanted it to look.